Oh come on! Why can’t I find the name of the actor as Wat Dee? A substantial role but no name?! I was ready to sink this series, and for the 1st 5 or so episodes where usually it will tell you whether to continue or to abandon ship, I was ready to abandon ship not because it was boring but because the storyline was disconnected or independent of one another. But I stuck with it, I persevered and as it went by, I have to say, this ship not only sailed, but it sailed fine and smooth. In the end it was one of the most pleasant journey for me, and definitely one of the best TVB series in recent years which actually had a good ending. In fact I really love the last ending scene. Now for the long opinion. By the way, this isn’t a disappointment like Dead Wrong and I think there are some similarities with Black Heart White Soul except the ending of Black Heart White Soul was quite interesting and different. Perhaps true. I think if given time, Wing would have let her go. He lied he recorded her confession and what she did next was unforgivable. Wing was naive into thinking his goddess boss Cal will do the right thing but she was way past that and when she pushed Wing off the building, seeing poor Wing fell to his death so dramatically, frankly I hated Cal. But none could describe Cal better than the 3rd man to love her and that was Pak. Pak fell for her when she was already flawed, and many times wanted reasons to believe in her but when Cal behaved the way she did and told an incredible lie about Wing, a lie that Tze Yue refused to believe and one which Pak found hard to believe as well, he began to suspect her. It was easy to investigate about her but finding the evidence was hard. You can say Pak used love as a weapon against Cal but he had to find out the truth. The more he knew, the more he felt Cal was not only selfish, but incredibly self serving and in the end scary. Whatever pity he had for her diminished each time she said something off hand which she thought was smart but he knew was a mistake on her part. When he found out the absolute truth (but not about Wing yet), he almost wanted to let her go when she said something offhand which was her way to manipulate him, or so she thought but that was when Pak realised this woman was scary and he was determined to find evidence against her. So he pretended. He always had the upper hand, whilst Cal thinking she was the smarter one never quite realised she already lost in this battle of wits. Frankly it was no battle at all. And throughout these times, I thought Cal will go insane and the revelation in the last 10 minutes was to me a fantastic end. I really do love how Tze Yue and Pak ended the series with a light banter and how life goes on. If you rewind a bit, you can actually see that Cal was already doomed from the beginning. You see, there are 3 families in here. Cheung Hak despite his bad luck actually had a good ending as he started again. He found himself a great woman who loved him deeply despite his flaws but his flaws were merely cosmetic. He was never morally flawed. His sister whom he loved was also never morally flawed eventhough physically she wasn’t perfect. Then there’s Pak who was lazy and running away from work responsibilities, however he was also never morally flawed. He raised his niece who was also morally upright and when he was having a hard time at work, his niece cheered him on and even volunteered to have her allowance cut, she encouraged him to find a girlfriend and when he did bring one home, whatever her opinion was, she never said a bad thing about her. They depended on one another and her uncle, a good man raised his niece, a good woman. There’s Wing a hard working ultimate good guy who is righteous as he was decent. Cal’s lie about him goes to his character that almost everyone found it hard to believe. He was raised by a widowed mother who I suppose who was a decent woman as well. When she died, brutally murdered if I may add, I felt no feelings whatsoever. By that time, whatever pity I felt for her was erased by the fact that she blackmailed her own mother, all because of money or in her words; “MY MONEY!”. Kinda felt sorry for Cal but when she was so eager to move on and by her final act with Wing, same feeling as I felt when Chloe died. Nothing but disgust. These two deserved one another. He never answered her and she happily tried to convince him to see a colleague she knows and he happily dismisses her effort as he said he is wary of female journalists now. Frankly, you can debate if he did or did not, but I do think he did love her. The only flaw in that rooftop confrontation scene between Cal and Pak was when she screamed why he can’t let her be, he said he was a cop. I felt that was just too PC talk. He should have just said because it was the right thing to do and killing Wing was the last straw to her humanity. Other than that, yes I do think he loved her and he loved her very deeply, enough to want to marry her which I feel is a bit of a stretch since he was investigating her at that point but whatever love or affection he had for her turned to disgust when she displayed her cold calculating manipulative ways and he began to doubt her sincerity and was convinced by her selfishness and even then he wanted to believe in her. In the end, I believe whatever affection he had for her turned to pity. And when enough time goes by, that pity will turned to nothingness and you can’t blame him. It wasn’t his fault she made her choices and turned out the way she did even if you can argue, technically he is the worst boyfriend for pushing her over the very last edge of her very last sanity. But as I repeated many times, for what she did to Wing, she had it easy in the end. There are so many characters in this series, some for a short time, some for a long time, all of them properly developed. Even the villains are good. You often see unknown actors as the guy next to the supporting actor, in here you see those unknown actors becoming supporting actors getting major spotlight. I don’t know his name, but I often seen the actor who played Wat Dee. Man, that guy got quite a body doesn’t he? He has played a whole range of characters but never one that gave him such range. Wat Dee is cruel, he kills without mercy, he is scary and he is a terrible person. And his death scene is memorable, harrowing, suspenseful and a proper send off to such a terrible evil person. And he dominates as the bad guy and he is so convincingly bad, many times you will feel scared for those people standing next to him. I rank him as my favourite bad guy in here. There’s the two bumbling foreigner thieves at the beginning who sadly met with very terrible ends that may not fit their crimes. They were funny! and sad at the same time. There’s Hung, the decent looking but turned ugly looking girlfriend of Hak who has a heart of gold. This series does try very hard to drive home the point that don’t judge a book by its cover. She was the super dedicated woman crazily in love with Hak who in the end loved her back and she turned out to be a great supportive girlfriend. Can’t help liking her and her bravery and in a sense her stupidity in going on the run with Hak. Hak is no super brainy person too. But I find it funny, those scenes where fans mistaken him with a superstar named Koo and I suspect that’s Louis Koo because of their similar back. And then there’s my very favourite character, Wing. He shows himself as someone not only righteous but also kind. The kind words he said to Fei Fei can only come from a very decent person and there’s no more decent person than Wing whose kindness killed him. He also has the distinction of having the most convincing fall from building and thereafter as a corpse, with the blood and all, it hurts to watch that scene. Fists will wave at Cal for what she did. The 3 bumbling thieves, that is Cheung Hak and his 2 fellow countrymen. This series is realistic in the sense of deep prejudice of mainlanders and the disadvantage due to their accent. They tried to find decent work, there were a few scenes where Hak wanted to bargain for a lower salary just to get a job and got rejected because there’s a minimum wage law and so happily he got paid more than he asked for and yet when trouble looms, he is the first to get kicked out. Most of the time for good reasons because Hak often did more than he should and so troubles arose from his eagerness to do a good job. I don’t really like these 3 not because they are bad people but because for 16 episodes and more, I couldn’t understand why they were there. Three and they belong to the same family. The greedy awful 2nd husband of Cal who became a constant irritant in her life. Am surprised she never killed him. Then there’s Cal and I have explained enough why I hate her. But my very special “affection” for the hatred category goes to Chloe. She was impossible. The fact that she constantly talked about money is one thing, her constant battle of words with her step father and thus causing Cal much anguish is another, but her making Cal constantly choose sides is just terrible. However the ultimate was blackmailing her own mother, effectively calling her mother a man hungry woman who will die without a man (even if true, still coming from a daughter.. that’s so low). She doesn’t deserve to die that way or to die at all but no pity. What a terrible daughter. 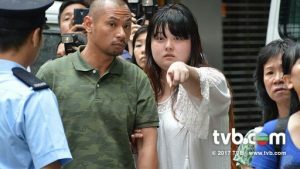 Can’t blame Cal for her anguish when she said bitterly that her daughter blackmailed her, you can feel how it deeply affected her. Only know Oscar Leung in one of his best performance for a character that was in this series for just a few episodes. His ending was shocking but it does make you wonder, is Wat Dee so scary that this scary follower of his is so scared of that guy? Well you get about 15 episodes or so to explain in full details that the conclusion is yeah, Wat Dee is a scary dude. This series began with a major corruption story that led to the corruption of Cal, literally and figuratively. There seems to be many branches to the story, from Wat Dee to a guy named Ma Chi Bun to ultimately Yim Ching Sum and in the middle many side characters who all ultimately lead to that story about illegal chemicals used in wall paint commissioned by government agencies. The entire series is about this one case and it may seem tedious, but for once, this is one series where you see a cop doing actual cop work. Pak actually investigates and he needs to get evidence, first against Wat Dee, then against Yim Ching Sum and also ultimately Cal. You see him pouring hours of work and many of which are guesswork and detective work. Starts with a theory and then proof to back it up. Can’t find proof? There are ways to use to lead to that proof. Basically this series is more police work than many police drama you have seen. It’s not just interviewing people, it is actually looking through old files, sitting down and brainstorming, doing character charts, getting files from other departments, making calls, finding informants, leg work, car driving, spying, setting up equipments, doing reports, reporting to superiors, getting permissions to do something and yes, even on procedural stuff like how to keep Wat Dee in lock up for more than 2 days (make sure you arrest on Saturdays or during public holidays next to weekends and more public holidays), getting warrant, etc etc. 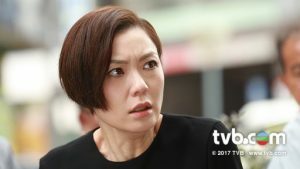 I was very impressed with the amount of good reasonable police work in here and I hope to see a TVB series where the same sort of stuff is afforded to lawyers or doctors, the amount of analysis, research, etc. At some point you get to see Pak about to make dubious choices as a cop that you will perfectly understand. 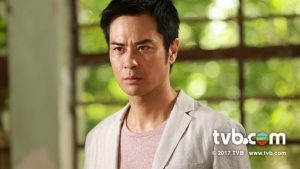 My god, as I write this, I do feel I have watched a proper cop series from TVB for once! However this series also have too much monologues. I was waiting for one of them to talk to the camera or as they say, breaking the fourth wall. Or make it Shakespearean sort of rant. Well you have that a lot with Cal. She rants a lot to herself, always when desperate or scared or questioning why won’t they leave me aloneeeeeeeeeeeee moments. For Pak, oh so many talking in his head. He talks to himself a lot, and a lot in his head. At one point you get Cal talking to Pak and in her head she explains why did she so, and Pak same thing except he questions why and what and all that stuff. So if you are ever lost as to what they’re talking about, no worries. They will explain to you in their heads. I am not minding this much because it shows Pak saying one thing, meaning another. He is no hypocrite, he is just questioning. But Cal, she did the same thing and the sense is she is manipulative and conniving and ultimately a hypocrite, an observation Pak had, in his head. Some viewers may feel Pak is also manipulative but there’s good manipulative and then there’s Cal. You can’t beat her at her own game by being honourable. Look at what happened to Wing. Like Hak said when he was asked did he set the microwave to explode and thus killing the assistant of Wat Dee (who is also a very bad man) and of course he did not because Cal did and he immediately said “Wow, that woman is such a cruel heartless woman, she wanted to kill me too!”. Very accurate observation. Whilst Cal was justified to kill the man who killed Chloe, to want to kill Hak was simply to kill all witnesses to her corruption crime and that was cruel. And then there’s the super tedious repetition. Again if you’re lost at some plot points, like how did he find out, no worries. Most probably, this series will have Pak explain FROM THE BEGINNING and you get flashbacks that takes forever to finish. There goes another 20 minutes of flashback, so to speak. The first one on how he recovered his handcuffs was the worst. At that point I wanted to give up on this series as I have tweeted it really felt like it was Destination Nowhere, plot wise. There’s also seeing ghostly apparitions scenes except of course there’s no ghost, just wishful thinking of some characters. And also plenty of one person rants/monologues where it is spoken dialogue, not just in the head. Like I said, quite Shakespearean theatre stuff. All these amounted to at least 5 episodes too much for me. On the upside, you get to see, hear what the characters are thinking so you are never in any doubt whether Pak’s good or bad, Cal’s crazy or nice, etc etc. Takes the guesswork out. I think at the top of everyone’s mind is how were Kevin and Kristal? In fact there’s 3Ks in here, Kevin, Kristal, King Kong. Never a fan of hers but of course she can act. But like one observer who was watching this series with me said, in any given scene she is fantastic, but when you piece all her scenes together, it feels disjointed and it feels like a scene per scene performance. Like if she’s happy in that scene, she’s convincingly happy, if she’s desperate, she looks really desperate but when the scene calls for happy to desperate, scene by scene next to one another, her performance falters because she is not convincing in the transition. Frankly, that was what I said about Charmaine Sheh many many times and after hearing that, I gotta admit, my fellow viewer was dead right about Kristal Tin. It could be the editing is not as smooth, it could be in the writing, or it could be to show how Cal is descending into madness. But true, the transition is not only not smooth, it feels so jarring. There’s no continuity to her character but there is also an advantage. If one scene she’s so sad and then so calm, it does perhaps help to lend credence to the fact that Cal is one cold calculation woman and that she could be so calm when she was so desperate means a woman so in control of herself but yet others like Pak could see right through her fakeness. So in a way, that jarring transition helps her performance. I am more concerned with the fact that I felt nothing for her Cal since day 1. First is because I never like Kristal even if she’s a decent actress. But as the show goes one, it is because I feel Kristal does not have that quality of an actress who can grab people’s emotion and latch onto them. Some actors or actresses could do so well that the viewers might begin to feel sorry for the villain even if the villain is terrible. Like how Roger Kwok was in any given role. Like some who despite doing bad stuff, you can’t convince yourself they did it deliberately. You question if they are doing it for some reason. Some actresses are not good actresses but viewers like them and so feel for them. For me Kristal doesn’t belong to that group. Her Cal should be someone that garners our sympathy and when she did the unthinkable, our hatred and finally when she begged Pak to let her go, maybe a tinge of sadness and ultimately when we see her in the final scene, sadness that she should become that way and only if she didn’t take the bribe in the first place. Someone who when she said to Wing that her life was pitiful, you not only agree yes, plot wise but feel for her as well. Kristal to me lack that connection, I just don’t feel that way about her so basically it was easy to dislike her and then to hate her and in the end feel nothing for her except “You reap what you sow” when it should have been “If only… if only..”. Whilst her age is right for Kevin, she shares zero chemistry with Kevin. They don’t look like a couple to me, I don’t see the attraction and even if the relationship is one based on lies and wondering if at least Cal had ever loved Pak or vice versa, I don’t feel the togetherness. If I had a chance to recast, I would have loved to see Maggie Cheung Hor Yee in this role. She may not be the best actress, but she doesn’t go OTT like Kristal who did well in desperate moments but I feel nothing for her desperation except on paper. On screen, I feel Maggie could portray Cal with whole background without showing me at all. No doubt Kristal might get at least a nomination for 2017 TVB awards, but there I feel is an actress who could do this better. In fact I will say why not get.. what’s her English name now? Used to be Noel Leung? Leung Siu Bing? She once acted as the villainous Cixi if I remember correctly and she had my pity. This series is touted as his last TVB series but I doubt it is for EVER. So no worries, he will be back. Am pretty sure like how fans reacted to Gallen Lo in Provocateur, you may also say the very first thing when you see Kevin; My god, how much he has aged! Well, TVB saps your youth away, as much as a young girlfriend does! Ha! Don’t get me wrong, I love Kevin as a celebrity person, but as an actor, it takes the right role. He found his breakthrough in either Ghetto Justice to some but to me it was Bu Bu Jing Xin (I refuse to call it by that stupid English title). He was so good in BBJX. In many ways Pak reminds me a lot of his performance in BBJX; don’t give him anything too dramatic or if you must, nothing more than a few minutes because if any longer, you can see the flaws in his dramatic acting. He is perfectly suited for Pak; those sort where he is easy going, charming, nothing too over the top drama or comedy wise, and he reacts well to situation comedy by using his dead pan good looks and good humour. What surprises me was the depth of his performance. Let’s face it, he was never in depth straight into your soul sort of actor, not even in BBJX. He played the elegant sophisticated but slightly troubled 8th Prince to perfection and he hardly raised his eyebrow in that series. He didn’t even scream except maybe in despair. In this series, his performance of a not so elegant man is very elegant. I could find flaws but that makes Pak even more charming. I didn’t like his Pak at first but unlike Kristal, I do think viewers can connect with his Pak very much as a single guy raising his only living relative. His chemistry with Kristal is nil but with Winki, it grows on me to the point I am convinced of their affection for one another. He’s not supposed to be too old or much older than Winki’s Tze Yue anyway so he is more like the fun uncle than the preachy parent uncle. He makes a convincing detective, the way he analyzes, the way he figures things out. He looks like an intelligent guy. Frankly many times this series everyone figures things out very very easily but I like the process he goes through, how he sees one fact, eliminates, sees another, accepts, finds proof. Kevin is convincing as that sort of thinking rational calm man who doesn’t overreact but strategize and formulates a plan. At first his Pak did the same thing but to irritating effect. Later as he grew into his police role, you will see that detective side of him using the same thought process. The last few episodes showcases Kevin’s maturity as an actor doing dramatic stuff in a more convincing way. The way he had to shout at Winki’s Tze Yue and how much you can see that that act of shouting at Tze Yue shredded his heart to pieces and in the end as he held on to Kristal’s Cal as she begged to be let go and how much he wouldn’t. Or the scene where he saw her again in prison and I can’t describe his expression adequately except maybe disbelief, deadpan disbelief or something like that. This role is made for Kevin and I can’t quite imagine another with his easy charm and mature way of dealing with things could do better than him. Kevin is like an old soul in a now aging body but sometimes there’s that playfulness and there’s that steady good natured humour. Having seen him in person, for me, Pak in the later parts does closely resemble the Kevin I have seen. In so many ways, I really like his performance in here which to me is one of his best and most steady consistent performance ever. It helps that his character is properly developed and there is a good ending for him so I do think, if this IS his last TVB series, EVER, what a way to go. My heartfelt congratulations to Kevin for a job well done. Kudos you handsome charming devil. His Cantonese improved a lot, even if still skewered. His Cheung Hak is someone you can like, I do like him even if I question many times whether his character is needed or not. Frankly, I don’t think his character is needed but his character with the character of Hung does provide for some special moments in this series. I do find his performance convincing as a hard luck Mainlander who really wants to do a good job but bad luck and bad choices doomed him. His ending was uplifting as it should be. It was a good performance and a steady one throughout. I really like May Chan but like for Cheung Hak, I wondered if Cheung Fei is needed. However her presence shows how kind Tze Yue and Wing were and also humanises Cheung Hak, if not Cheung Hak is just stupid without something to cheer on for. But her performance can be irritating. However I commend her for letting go. The scene where she was so upset at being fired that she cried her heart out by the sea and eating chocolates until her face, lips were messy with chocolate is not easy to watch but it is essential to show how much discrimination and biasness she faced due to where she was from. It does make her look ugly but in the end the one who’s ugly is the people who mistreated her. There were many scenes where she is in scenes that many actresses may not want to be seen in, but May Chan was hired to do those ugly moments and she did them with aplomb. She was convincing when she is sad or silly or her affection and loyalty to her brother and I thought she was so convincing in those scenes where she was in pain and on the run. Yes she may talk in irritating high pitched voice when she is sad or happy but she can act. I long to see her act with Vincent Wong again, they made a cute couple! I don’t think many actresses will want to be Hung, more so when she is described as someone ordinary looking made worse by plastic surgery. Even without the fake big gum in her mouth, obviously this actress did too much surgery on at least her nose that she looks unnatural. It is not a pretty sight but in this supporting role, as the love sick and fiercely loyal Hung, she excelled. I enjoyed watching her banter with King Kong and if she wasn’t in this series, King Kong would have been tedious to watch. I admit I was critical of her at first. I did say she wasn’t pretty enough to be Kevin’s niece but I suppose if you put two very attractive people next to one another, they may cancel each other out. Over time I grew to like her Tze Yue. Her performance is pretty straight forward and is convincing as well. Her crying scenes were very well done, especially her grief at Wing’s death or her absolute disbelief her uncle would choose Cal over her. She shares some amazing chemistry with Kevin who does look and behave like her uncle. She is the one with the most hairstyle changes and her last scene, where she lets her hair go and has shoulder length hair made her look very pretty but no, she can’t play Kevin’s lover. She is officially his niece for life. I wonder why his nickname is Kwan Gor. Anyway, must confess, he is not a pretty sight. I mean look at him; he ain’t tall, he looks a tad big, he has nerd hair, nerd glasses, strange teeth and a very ordinary face that doesn’t spell STAR. And yet, man I love this guy. He can act. Oh yes! He may be deadpan, like he can compete with Kevin on that and yet there is a very straightforward sincere way in which he delivers his lines. He does it without drama, without fuss, he doesn’t use huge hand movements, he just delivers. In fact I think he can do his entire scenes sitting on an armchair and still can convince me his Wing is a decent guy. Some people exudes that quality, like Felix Wong, like Steven Ma and here, this guy exudes the decency of Wing so much that when Cal did him in, you will hate Cal for it. His Wing is not an easy character to play. How can anyone be so nice without being a boring at the very least or hypocrite at worst? Well, Kwan Gor can. He also has one of the most convincing death scene and dead body scene. But when you dismiss him by saying he can play easy going only, he steps up with that confrontation scene with Kristal, in one of the scariest moment and he handled himself well. He expressed his shock, disgust, then pleading for Cal to turn herself in, made a bad lie, and the moments before his death, pleading for his own life, the entire sequence was fantastic from his performance alone. Kristal was at times OTT but this guy, he was steady and when he was required to cry and be angry and frustrated, he nailed it. A wonderful performance and I hope to see more of him. From Tiger Mom Blues to this, now we are sort of spoiled for choice in terms of young-ish actors. I am sure there will be some suitable character for this actor to portray but I will forever remember him as the tragic decent Wing. When I look at her as Chloe, I thought maybe she can be Tze Yue since she is the prettier version. She does sound old doesn’t she? But when she was dressed in school uniform with little make up, I was shocked to see how young she looked. Her problem is she has an old voice and that spoils the performance a bit. But she can act; she does Chloe in how we all should see her as; selfish stupid silly girl. A very good performance and again, another young actress for TVB to choose. I like her nickname, Brother Nat or Nat Gor. That’s how her colleagues see her. Competent performance with some comic moments. Notable mention to the actor playing Wat Dee. If you know his name, please let me know so I can credit him. He was convincing as the crazy scary Wat Dee. Very convincing performance. I really enjoyed Parkman’s performance as Wong Sir. His is more like comic relief and his banter with Kevin was very funny to watch. A pity he disappeared later on and suddenly Nat Gor is permanently in Pak’s team. The other bad guys are great too although I can’t name them at all since I don’t know their names. Some more hypocrite than evil but all great performances. Due credit must be given to the 2 foreigners who played the thieves in the first few episodes. They were funny as well as very good actors. However a few faltered, such as Louise Yuen, Tyson who played mainlanders with very very bad accents that it was painful to watch. And yes, that awful husband of Cal has the distinction of being the worst actor in this series. A complete jerk but the performance was sub par and cringe worthy. Funny, he was the good dead husband in Tiger Mom Blues. Performance wise, as in acting wise generally, frankly I find this series has pretty high standards. You must have patience when watching this series, as in 16 episodes of patience if you are waiting for the 2 leads to meet and if you want to watch a great love story, don’t watch this one. Watch this series for what TVB does best; family stuff. And watch this series for what TVB gets right finally; detective work. 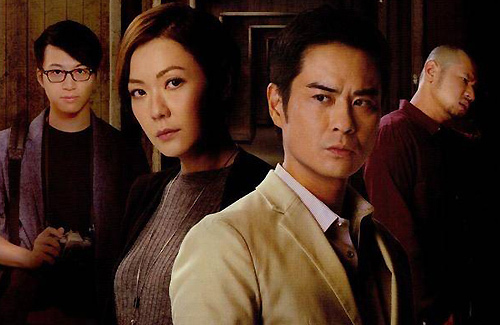 Also watch this series for what TVB never tries hard enough; develop characters in a character driven plot and spending 30 episodes on a singular plot device that is same story that didn’t matter because in the end , it is the corruption that matters. And finally, watch this series for something TVB rarely does; lovingly create a series that made sense, that talks sense, ends sensibly and is in the end about sense. If only Cal had more sense than her desperate need to please her daughter, she wouldn’t have been “lost”. You know, the Chinese title explains it all. This review is written by Funn Lim, a Contributor at JayneStars.com and was originally posted at www.point2e.com. The actor who plays Wat Dee is Stephen Ho Kai Nam (何啟南). having a little trouble posting my diatribe, so if you see this twice sorry! can someone familiar with hong kong law explain to me why it was such a big deal that cal took the bribe in the first place? she’s a reporter, not a government employee; was she really in that much trouble to begin with? ethically wrong, sure, but criminally wrong? how many years are we looking at? probation max probably right? @rucofan1100 HK has very strict anti corruption laws. their ICAC is probably very very strong. Well she knew laws were being broken, probably leads to loss of lives, etc so she was harbouring criminal activities at best I suppose. No one wants to go to jail especially Cal even if just for a day or two because her reputation will be ruined. She doesn’t want that. on another note, everybody loves kwan gor but c’mon, really you’re gonna do that to your sifu? just because she didnt publish your research? forget the fact that she took money to open up a a damn business FOR YOU! forget the fact that her DAUGHTER JUST DIED! let’s just send her off to prison in the name of justice! oh no wait—she’s a REPORTER! who cares?!?!? @rucofan1100 I agree to a certain extent. She killed him, remember? Whatever justification she had, she lost her humanity when she basically pulled his fingers off the ledge. How can you sympathise with her? It is not justice, but righteous. He was trained that way by Cal herself, he believed in her, he trusted her, but she betrayed his trust repeatedly. Yes she had good intentions when she opened the business for him but he never asked for it, and he certainly won’t agree if he knew it was because he had to betray his conscience. I know morality worth very little these days but for Cal, her pride and in the end her own selfishness outweighs her love and consideration for others. AND OMG can someone explain to me how chloe accidentally banging HER secret camera watch on the wall activated the camera app on king kong’s ipad?!?!? way too convenient!!!! @rucofan1100 That you need to ask TVB. or how kevin’s niece insisted on kwan gor being innocent and cal being up to something, which while obviously correct from our audience’s perspective, all evidence including the surveillance footage backed up cal’s side. her story really wasnt that far fetched! @rucofan1100 Quite simply because Wing has always been very righteous. After he died Cal not only killed and lied, she basically defamed his character. No one believed it, especially not the niece who knew in her heart Wing was a good decent man. Even her uncle started to question Cal when she accused Wing of corruption. Watching the entire series, if anyone said Wing was corrupt, no one would have believed her. And since Tze Yu was sure Wing didn’t take money and kill himself, therefore Cal must have lied. Simple logic. also remember when kevin catches king kong and king kong admits to stabbing the henchman? @rucofan1100 Purely self defence. And yes King Kong did jump to conclusion Cal set him up, which was far fetch but slow down another 15 min the same conclusion wouldn’t be illogical. Funny what you said about Kwan Gor’s look. He is indeed not very handsome, but, I like him the first time I see him perform onstage in ‘The Voice’ competition, and prominent HK musician Anthony Lun also commented that he will have a lot of fans after seeing said first performance. I think he has the adorkability factor. The Kwan Gor nickname was given by the MCs (coincidentally one of them is Krystal Tin) as a way of teasing him, but, it stuck. I think someone forgot to mention Eddie Pang the bald head guy?